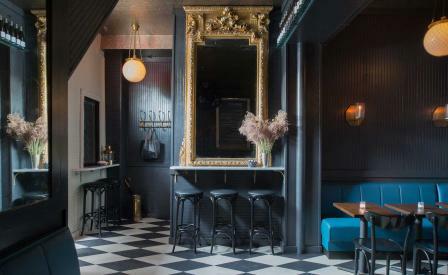 Despite its diminutive size, the cosy East Williamsburg cocktail bar and restaurant Little King, opened to much aplomb. Hidden next to a busy fruit and veg shop, the space’s unassuming frontage harks back to another time with its aged, original Ralph Walker doorway. Co-owners Sam Esterman and John Moskowitz wanted to create somewhere that looked ‘like the back entrance to something more grand, like an employee lounge of a once-grand train station’. With the aid of designer Christina Salway, Little King has been adorned with vintage pieces found at garage sales and estate auctions, including the pair of gold entrance doors and a French gilded mirror that dates back to the late 19th century. Suspended bulb lighting, bright blue upholstery and hand-stenciled herringbone floors serve the perfect finishing touch. Little King’s food and beverage menu is equally well thought through. The small but impeccably formed cocktail list is made up of new spins on the classics, while the kitchen doles out substantial favourites, like roasted bone marrow, a signature burger and a changing selection of daily specials. Chef Phillip Vernier, formerly of Five Leaves, has recently added brunch too. From breakfast bowls to savoury waffles served with duck confit and scallion butter and a variety of Bloodies (Mary – vodka, Molly – gin, Maria – tequila, Maguey – mezcal), finding a seat will not be easy.